JUST as James Watt will always be associated with the stationary steam engine, Trevithick and Stephenson with the railway locomotive, Zeppelin with the modern rigid airship, and the Wright Brothers and Santos-Dumont with the aeroplane, so the names of Karl Benz and Gottlieb Daimler will always be associated with the birth of the motor car. Yet there are thousands of people, active and keen motorists in their way, who have but vague ideas about the origin of the machines which they use so constantly. Perhaps it is because we are so much taken up with cars and motor travel generally that we tend to live perpetually in the present. The same disregard for the past is evident in the youth of every great industry; Stephenson’s Rocket, for example, survives in South Kensington Museum by an accident, having been rescued from a scrap dealer. We should not laugh at the “old crocks”; they are worthy of wonder and admiration. The chapter beginning on page 253, dealing with early steam coaches, gives some account of the first attempts to mechanize road transport. Between the brief activity of the eighteen-thirties and the rebirth of the mechanical road vehicle, numbers of experimental steam-propelled cars were built by enterprising engineers, and saw the light of day for a short time. These cars were but lightly regarded by the general public. In later years, the drivers of some of the early petrol cars were fated to be reviled, persecuted and even assaulted. Moreover, though there was a belated revival of steam cars, the early steam carriages had but little effect on the advance of the motoring industry. The credit for the invention of the motor car, propelled by an internal combustion engine, will probably always remain unallotted. An Austrian, Siegfried Markus, designed and built such a car, a four-wheeler, and is said to have taken it out on the streets of Vienna. Details of the machine’s performance, however, are somewhat vague. It is to a small group of men that the modern motor owes its existence, and those men worked almost independently of one another. 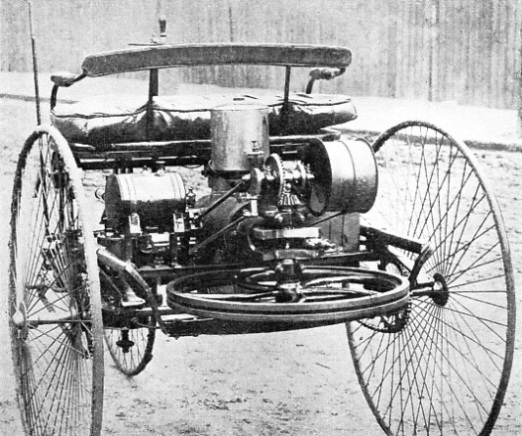 One of the first of these inventors was Karl Benz. Benz was a German, and was born on November 25, 1844. Brought up in poverty, he was able, at the age of 17, to take a course in engineering and mechanics at the Karlsruhe Polytechnic, where the arguments of his tutor, Dr. Rechtenbacher, convinced him that there was a great future in store for the light mechanical road vehicle, propelled by something less cumbersome than the orthodox steam engine of those days. Lenoir had produced a workable gas engine, with flame ignition, in 1860. Rechtenbacher hinted at internal combustion, but did not commit himself. In Benz’s mind, however, the idea lay dormant, ready to leap into life when he was older. At the age of 21 Benz left the college and became a mechanic in the shops of the Karlsruhe Engine Company, a firm devoted to the building of railway locomotives. There he worked for thirteen hours a day. In the evenings he returned to his attic, where until the small hours of the morning he worked out his earliest schemes for the motor car. During this period he acquired an old “boneshaker” bicycle from someone who was willing to get rid of it at any price. The bicycle gave him a fresh idea. He would construct a self-propelling tricycle, driven by some form of gas engine. In 1870 Paul Hanlein designed an airship propelled by a gas engine. If such an engine could be made light enough to be supported by a balloon - a coal-gas balloon at that - it could be made light enough to drive a small road vehicle. The idea inspired by the boneshaker did not, at the time, reach a tangible form, but it was of importance in the earliest history of the car. A photographer named Buhler was so delighted with some plates that Benz had made for him that he took the penniless young engineer into partnership, and the two set up as manufacturers of gas engines. Instead of coal gas, Benz used petrol; he designed a surface carburettor to atomize petrol before passing it into the cylinder. After atomization in the carburettor, the spirit mixture was admitted to the cylinder through a slide valve. The new type of gas engine grew in popularity, and a limited company, the Mannheim Gas Engine Company, was formed to market it. Benz wanted to go farther, and to apply his engine to a lorry, to carry heavy materials to and from the railway yards. Buhler and the other partners had no faith, however, in the possible production of a workable car. They had taken up Benz’s adaptation of the internal combustion engine, but, when it came to “horseless carriages”, Benz had to work alone once more. He had saved a little, and took the risk of leaving Buhler for good. Shortly after this he went into partnership with Max Rose. Rose had little more faith in the future of the “horseless carriage” than Buhler, but he was prepared to back Benz within certain limits, as long as the production of gas engines continued. In these engines Benz made sundry improvements, replacing the old slide valve - a relic of his experience with steam - with a poppet valve. For the time being he continued to use flame ignition, there being no alternative. Rose was ready to sponsor a motor car as soon as he saw some return on his capital. In the meantime, Benz gas and petrol engines continued to grow in popularity. Benz realized that, to apply his motor to a vehicle, he must increase its running speed and power output, and reduce its weight. The normal speed of his stationary engines was some 120-130 revolutions a minute. For a petrol-driven locomotive vehicle, at least 250 to 300 revolutions would be necessary. From the beginning he had disliked flame ignition, and he determined to find a means for replacing it with an electric spark. At first he used a simple apparatus consisting of a series of cells, an induction coil and a commutator, giving a spark by means of a simple plug. As the vibration of the engine ruined the cells, Benz tried a small dynamo, driven by belting off the flywheel. This he found even more unreliable, so he returned to the storage battery and set to work to make this proof against its former drawbacks. THE FIRST BENZ MOTOR TRICYCLE, built in 1885. The engine was mounted over the rear axle and had a single horizontal cylinder, with a vertical crankshaft which drove a large flywheel. The engine was rated at ¾ horse-power and ran at a maximum speed of 250 revolutions a minute. The driving shaft was divided and fitted with a differential gear. Final drive was by chains. Edward Butler, working in Great Britain, built a petrol tricycle, with electric ignition, independently of Benz. It had two cylinders, a surprisingly modern carburettor, and a magneto for generating the ignition current. In 1888 he built an improved machine with two steering wheels in front, of 32-in diameter, and a single 30-in driving wheel at the rear driven by two water-cooled cylinders. The original arrangement comprised a two-stroke engine, direct drive and magneto ignition. This was replaced in 1889 by a four-stroke engine with an epicyclic gear and high-tension battery ignition. The red flag law of the Highway Act, however, stultified Butler’s independent invention. 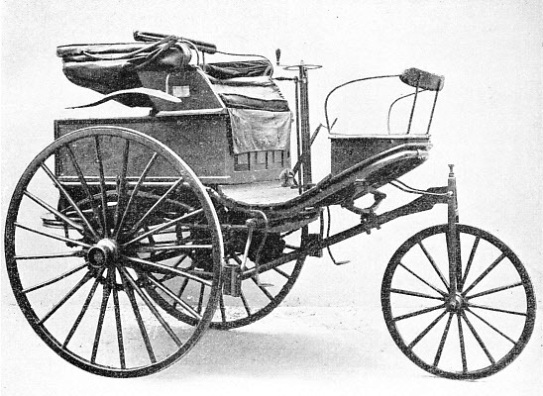 The same legal disabilities applied to the second British car, a converted horse phaeton fitted with a 3 horse-power Petter oil engine, which was exhibited at the Crystal Palace, London, in 1886. This car survived to take part in the Lord Mayor’s Show of 1895. The engine was built into the box or boot at the back of the carriage, the whole arrangement being designed by Benjamin Jacobs. Jacobs became one of the grand old men of the engineering world, and died as recently as April 25, 1937. The continuous development of the motor car, however, is bound up with the story of Karl Benz. By the middle of the ‘eighties, when Butler was experimenting in England, Benz’s dream began to come true, and his first really successful motor trip took place one spring day in 1885. The car was a three-wheeler, a gigantic tricycle with the single steering wheel forward, and it carried a ¾ horsepower engine running at a maximum speed of 250 revolutions a minute. The engine was at the back, on its side, with a huge horizontal flywheel. Through a system of bevel gears it drove an endless belt connected to a driving shaft with reduction gears, situated forward. From the driving shaft a pair of endless chains ran back to sprocket wheels on the driving axle. The belt connected the engine with a pulley running loose on the driving shaft. The engine was thrown into gear by shifting the belt to a fixed pulley by means of a large lever beside the driver’s seat. Another essential feature was the differential gear, enabling the two driving wheels to revolve at different speeds while the car was rounding a curve. John Scott Russell had used a crude form of differential for his Glasgow and Paisley steam carriages years before (see page 257), but this had consisted merely of a clutch designed to throw the inner wheel out of gear. James Starley, the cycling pioneer, is believed to have made the first real differential in 1877. Benz applied a differential to his driving shaft, enabling the wheels to revolve at different speeds when this became necessary. To cool his engine, Benz had to make a minimum amount of water do a maximum amount of work. He placed a water jacket round the cylinder and connected it with a small tank overhead, relying on the natural law of circulation to keep the water from overheating. There was no radiator in the modern sense of the term. On a momentous morning Benz’s pioneer car issued forth to make its trial trip. This was carried out privately, in the works yard, with only Benz, Frau Benz and some of the workmen present. The engine started up without undue difficulty, but making it propel the car was another matter. Again and again the engine died down with a splutter as Benz let in his clutch. At last, assisted by a push from strong arms, the vehicle moved forward. Slowly Benz and his ungainly looking machine made the circuit of the big yard, while the men cheered him, and his wife, it is recorded, danced up and down with delight. Four times he went solemnly round the circular course. Then an ignition wire broke. This, however, was soon remedied, and the hero of the hour continued to ride solemnly round and round the yard in noisy dignity until the breakage of one of the side chains brought his first successful day of motoring to a close. After that Benz did not enjoy an unbroken run of successes. Some months elapsed before he announced that his pferdloser Wagen (“horseless carriage”) was to make its first appearance on the streets of Mannheim. When that unlucky day arrived, the car ran into the wall of the yard and damaged itself considerably, without reaching the street outside. A BENZ CAR OF MORE ADVANCED DESIGN, built in 1888. It is a four-seater, with wooden wheels and iron tyres. The engine, mounted horizontally above the rear axle, developed some 1½ horse-power at 300 revolutions a minute. A surface carburettor was used, ignition being by battery, coil and sparking plug. The single cylinder of the engine was water-cooled, the radiator being replenished with cold water from a tank under the rear seat. A week later, however, the car was in working order again, and soon after that it became one of the visible wonders of Mann-heim as it chugged its way along that city’s broad streets, pursued by excited crowds. When Benz had succeeded in covering a measured kilometre at seven and a half miles an hour, he was informed that that must be his absolute maximum in open country, half that rate being the highest permissible inside the urban district. Little by little the Benz business expanded and the Benz car was improved, though prejudice made a strong stand, as it was fated to do for many decades, especially in Great Britain. The fuel feed arrangements gave trouble. In 1887, Benz patented an auto-matic needle valve controlled by a float. The jet carburettor was already in use by then elsewhere, but Benz did not attempt to use this carburettor as he had never heard of it. Engineering and patent journals are a comparatively modern aid to the practical worker. Benz clung tenaciously to the use of his original surface carburettor, and continued to use it for a long time after jet carburettors had come into general use elsewhere. In 1890 he abandoned the practice of placing the engine on its side, though it remained horizontal on Benz cars until 1903. He introduced a two-speed gear, which he operated by running the belt from one pulley on to another. At the same time he remained faithful to many primitive features of his original design, long after other engineers had improved them out of all recognition. Until 1900, for instance, it was not possible to reverse a Benz car. By that time more than 4,000 cars had been built, most of them after 1895. The steering of the early Benz cars was accomplished by a vertical shaft, and this remained the standard arrangement for some time, even after the single leading wheel had been superseded by two wheels. Benz, however, was not so conservative as to cling to his original tricycle arrangement for long. Four wheels were better than three if a steady car was to be produced. Benz, therefore, arranged his front wheels on pivots mounted on stub axles, thus producing, in essential features, the arrangement that is universal on most orthodox cars at the present time. In the early years of the present century the Benz design was completely modified and brought into line with the designs of other engineers, which were then fast gaining in popularity. In 1909 a world’s record was set up by a 200 hp Benz car at Brooklands (Surrey), where it attained a maximum speed of 127·387 miles an hour. Karl Benz lived to a ripe old age. When he was eighty-one he attended the 1926 motor rally at Munich with his original car, which had been specially taken out of honourable retirement in the Deutsches Museum at that city. He died on April 4, 1929, and was given a State funeral, one of his earliest cars being driven in the procession. Another great pioneer conducted his experiments during the same period as Benz, but independently of him. This was Gottlieb Daimler. He was the son of a baker, and was born at Schorndorf, Wurttemberg, on March 17, 1834. He was apprenticed to a gunsmith, who rose in the world, received distinguished patronage, and moved to Stuttgart, taking young Daimler with him. Here Daimler met various influential persons who became interested in him, and enabled him to study engineering at the Stuttgart Polytechnic. After that he came to England and obtained a position in Whitworth’s works at Coventry. Eventually he returned, through Belgium, to his native Wurttemberg. There he met Wilhelm Maybach, whose name was afterwards to live with his in the annals of motor engineering. For years the two were associated with gas engine manufacture at the works of Otto and Langen, but Daimler yearned to produce a “horseless carriage”. 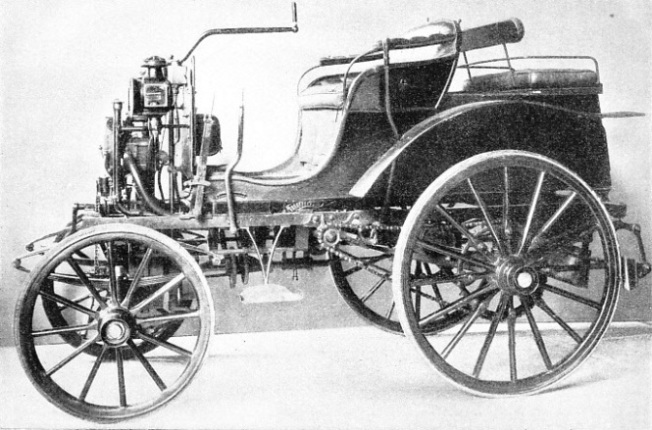 RACK-AND-PINION STEERING was a feature of the 1888 Benz car. The front wheel was mounted in a vertical fork and was steered by a short hand lever and a double rack and pinion. The front fork was connected to the rear axle by two “perch bars”, forming with the axle an underframe from which the carriage frame was supported on three elliptical springs. Daimler and Maybach resigned their positions in 1882 to conduct experiments of their own. They produced their first engine in 1883. It was a horizontal air-cooled motor with a speed of 900 revolutions a minute. Maybach designed the ignition system, which included a hollow tube fixed in the position where we would nowadays expect to find the sparking plug. Underneath it was a Bunsen burner with a small cup attached. Into this cup a little spirit was poured and lighted. This heated the burner and caused the spirit feeding it to vaporize. The burner produced its own flame, bringing the tube to a red heat and igniting the mixture admitted to the cylinder. The early form of tube ignition did not attain to any spectacular success in after years, though the platinum tube, much used during the ‘nineties, was to give it a new lease of life. The second of these two pioneer engines of Daimler and Maybach was built into a curious type of bicycle devised by Daimler, and this vehicle is believed to have undergone a trial trip on November 10, 1885. Its designers, however, were not impressed, and they transferred the engine to a boat. Here it appears to have done fairly well. The first Daimler car appeared in 1886, within a year of the pioneer effort of Benz. It was a four-wheeler with a centrally pivoted leading axle resembling that of an ordinary carriage. 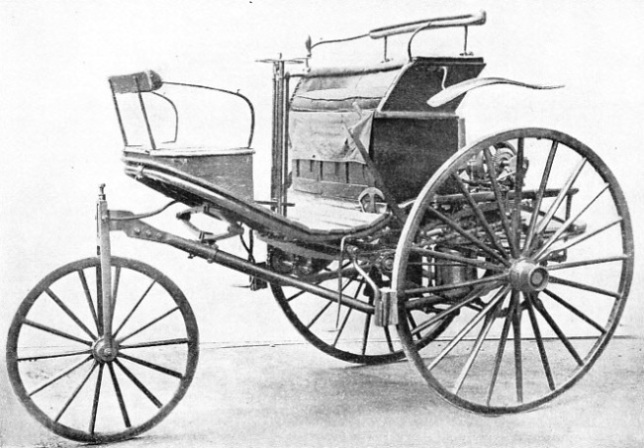 Benz aimed at producing a vehicle to supersede horse-drawn carriages; Daimler and Maybach at first intended rather to build engines that could be fitted to existing vehicles. Their first car was propelled by a 1½ horse-power air-cooled engine with tube ignition and belt drive, the fuel feed being regulated by a primitive turncock arrangement. Its differential consisted simply of a set of adjustable leather disks. Throughout their earlier progress, Daimler and Maybach continued on the lines of designing light internal combustion engines which could be used for propelling various types of apparatus. In 1887 one of their engines was fitted to a small narrow-gauge trolley on rails at Cannstatt, Wurttemberg, and in the same year Daimler motors were applied to a fire-engine and to Dr. Wolffert’s airship, which is believed to have been the first aircraft to derive its motive power from a petrol engine. In 1889 Daimler and Maybach produced another car, which had a water-cooled engine with a tubular radiator and a four-speed gear. This was the real forerunner of the modern motor car; the car of to-day owes much of its general mechanical arrangement to Daimler and Maybach. Its fuel it owes primarily to Benz, and its system of ignition to Benz and Butler. The foundation of the Daimler Motor Company in November 1896, and Daimler’s association with the French firm of Panhard and Levassor, belong to the second period in motoring history. Daimler was an older man than Benz when he entered into motor pioneering, and he did not live as long as his illustrious contemporary. He died on March 6, 1900, and thus just lived to see the fruit of his ambitions. 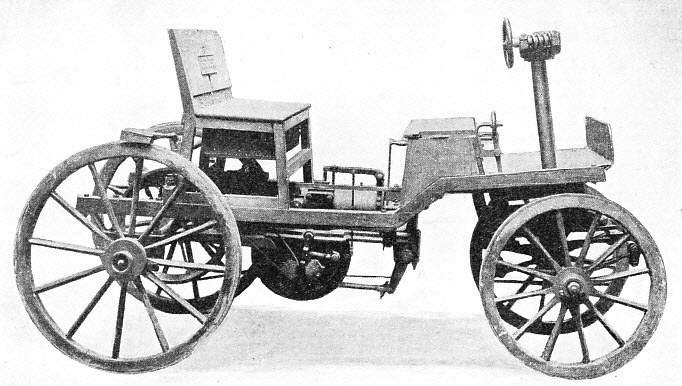 PANHARD AND LEVASSOR CAR OF 1894, built to the design of the German inventor Gottlieb Daimler, who had taken out a patent in 1889. A two-cylinder engine developing 4 horse-power at 800 revolutions a minute was mounted at the front of this French car and drove the rear wheels through a longitudinal shaft, change-speed gear, bevel gearing, transverse shaft and chains.